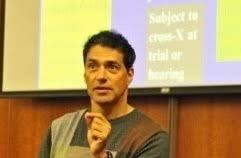 Because there is a natural overlap between the Evidence and Trial Advocacy (Trial Practice) courses, I created an integrated Evidence course with Trial Advocacy (where students engage in mock trial presentations). I thought it helpful for students to take these courses on an integrated basis so that they could apply what they are learning in my Evidence course experientially in their Trial Advocacy course. I make use of my Evidence Simulations book, in the course so that students engage in small group role plays, as well as full class role plays and demonstrations. I am also working on a new forthcoming book with Professor Paul Rothstein at Georgetown University Law Center entitled, Global Issues in Evidence, so that law students will be exposed to Evidence law as practiced in several countries around the world and then be able to compare and contrast various policy choices made regarding the admissibility of Evidence. I also incorporate experiential learning on my final Evidence examinations. I wrote a law review article as part of a national Evidence symposium entitled, “Objection! Irrelevant and Unrealistic: It’s Time for Evidence Exams to Evolve,” 50 St. Louis. U. L. J. 1223 (2006). In the article, I focus on student assessment because I think current traditional testing methods could be enhanced to be more realistic and relevant for law students. On my Evidence exams, I give students a 40-80 page pre-test exam packet consisting of a complaint, answer, discovery exhibits, photographs, reports, etc., several weeks before the final exam. The final exam is then based solely on the fact packet where the mock case goes to trial and students are asked to respond to various issues that occur at trial such as admissibility of various exhibits, changed testimony, motions in limine, and so on, the way a real attorney would encounter evidentiary issues in actual practice. However, I also provide ample opportunity on these exams for students to fully consider larger theoretical and policy issues in Evidence.